This past weekend, I had the opportunity to spend my Friday at Comic Con in New York City. 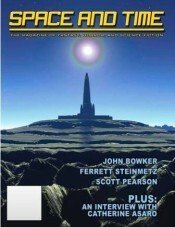 I had attended smaller cons before, but this was my first chance to experience such a vast event. By the time I made plans, I was only able to purchase a single day ticket for Friday. Apparently if you want the three-day pass, you need to buy one by Memorial Day weekend. This was also the first time that I wore a non-renn fest costume to anything like this. Entrance to the main floor. 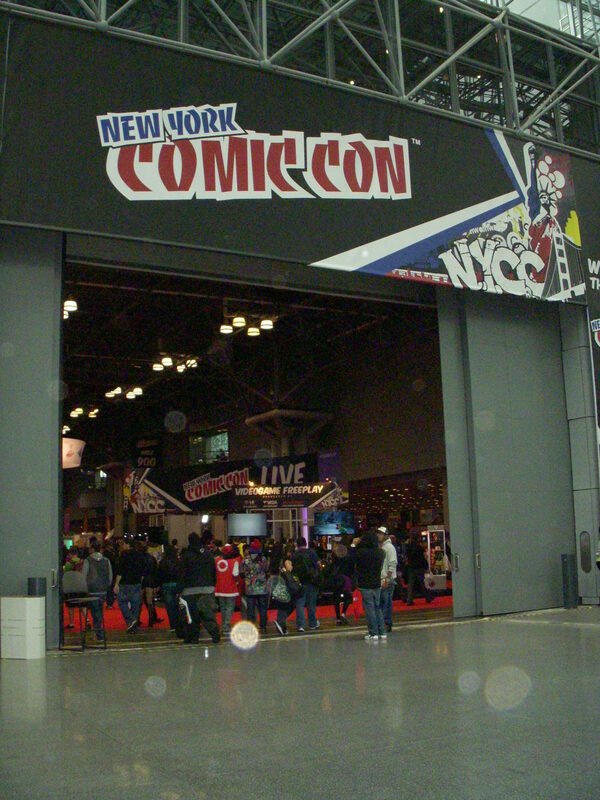 Comic Con is held at the Javits Center, a massive conference facility on the west side of Manhattan. I rode the train in from New Jersey, arrived at Penn Station, and stumbled out into daylight, hoping that I could find my way through the city streets. Fortunately, Batman was there to guide me. In fact, there were many cosplayers assembled outside of the train station. I knew that we were probably headed to the same place, so I followed Batman and friends. The workers at the con guided everyone through the entrance lines, and I passed through prop check and into the Javits Center. I began my exploration by wandering like a lost puppy. There were overhead signs to guide you to the important rooms – the main floor, the autograph and panel area, the main stage, and artist’s alley. I found a lanyard and a program and drifted through the main floor, where booths stretched across a vast hall. There were so many things to see – comic vendors, toys and figures, artwork, and costumes. 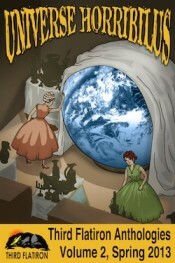 You could also find book publishers, video and tabletop games, and signings. I had been forewarned that there would be a line for the panels or any special session, so I made my way over early to see Jerome Flynn who plays Bronn in Game of Thrones. The wait gave me a chance to flip through the program and orient myself as to what I wanted to see. An hour passed quickly and I found a seat. Jerome Flynn was running late, but soon arrived and kept the room entertained, providing a glimpse of his experiences on the show and answering fan questions. 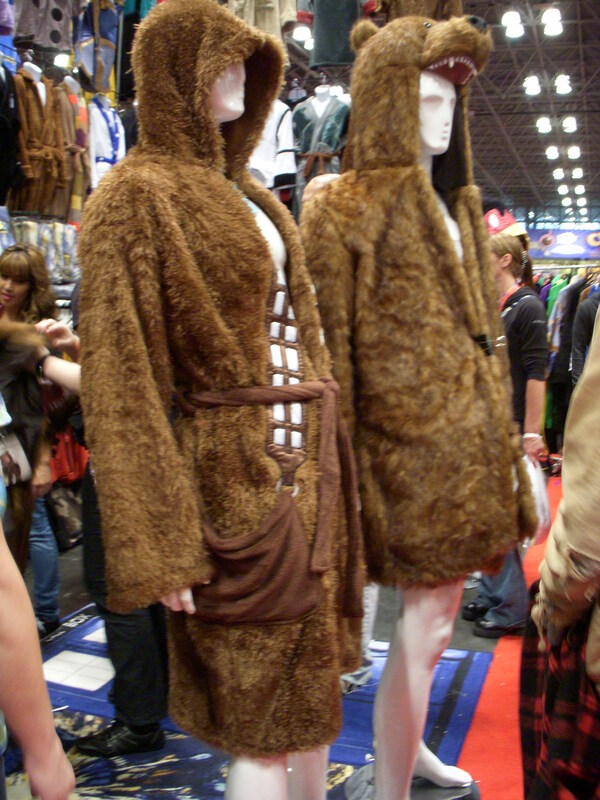 You could buy a wookie bath robe! I spent most of the day working my way through the main floor, people-watching, shopping, and just soaking it all in. The main hall was so large, that it was almost closing time when I reached the end. However, Artist’s Alley was open a bit later. I couldn’t leave without taking a look at that. While not as enormous as the main hall, this was still a huge space, and I wish I had found it sooner. Artist’s Alley was lined with rows of tables and was filled with small and independent comic artists and writers. I’ll have to plan more time to explore this area next year. One thing that I hadn’t prepared myself for was to answer to my character’s name. It was rather amusing to be asked to stop for a photo with someone, then have them react to my character. I cosplayed Daenerys from Game of Thrones, and I received a lot of encouragement to seize the Iron Throne. This Wonder Woman was spot on. The only downside to my time at Comic Con was that I felt a little sad that I wasn’t more familiar with comics. I’m going to try to attend the con again next year, so in the meantime, what comics should I start reading. What are your recommendations? Previous Ready to fence in 3, 2, 1… Next New Year, New Things – YAY! 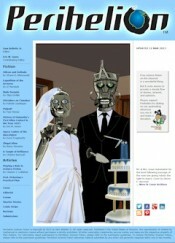 I liked your blog and am now a follower and watching. I hope you do the same. Good work here. Add a picture of yourself (in costume) to this post! Thanks for your perspective. 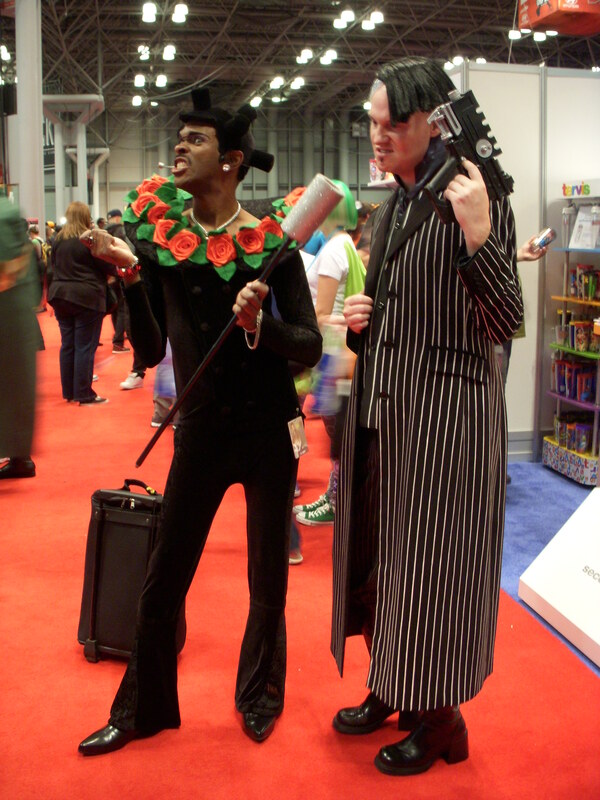 I’ve ben to a few mammoth trade shows at the Javits Center, but never Comic Con. NYC is a lot of fun on Comic Con days, when the streets are even more colorful than normal.